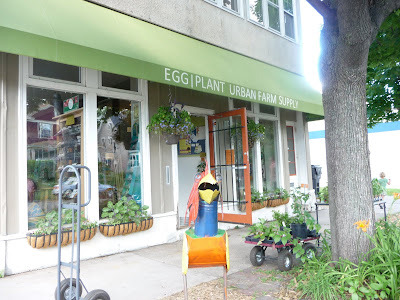 You’ve got to check out a great new store in town: EggPlant Urban Farm Supply. 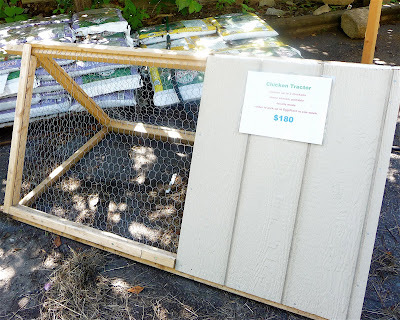 Whether you’re interested in chickens, gardening, sustainable living or just like to see what’s new, you’re going to love this store! The owner, Audrey Matson, is a farm girl turned urban gardener with a masters degree in horticulture. She raises chickens in her St. Paul backyard and decided to combine her two interests into one great store. Two years ago, Three Swingin’ Chicks posted a photo of Audrey with one of her chickens in an early blog about the Twin Cities Parade of Coops. Check out EggPlant’s link About Us to see our photo and read about the store. EggPlant has everything you need for chickens and gardening, from feed and seed to coops and tomato hoops. And guess what? They’re even taking orders for fluffy day-old chicks, which will arrive on July 21st. So if you’ve been thinking about acquiring chickens, this is the time. You’ve got a one-stop shop with expert advice thrown in for free! Gardeners will love the organic plants, fertilizers, the latest tools and books. They’re very open to new ideas and suggestions, so please go in and have a chat. EggPlant is on the cutting edge of a national trend in chicken-garden center combos. The Wall Street Journal has even taken note of chicken entrepreneurs who are cashing in on the urban chicken craze. 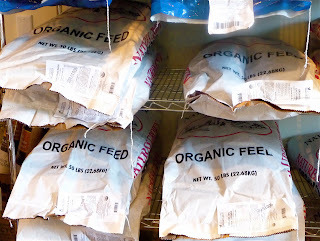 Some with specialty items such as chicken diapers, others with boutique coops or small batch chick orders. While I’m not sure my girls would ever submit to a chicken diaper, I’m all for anything that promotes the chicken revolution! Roxanne and Cleo have just cast a nasty stare in my direction at the mention of chicken diapers. They’re rather crabby at the moment. I guess I can’t blame them, these Minnesota cold-hearty chicks are outside stuck in the sauna. No, I haven’t built them one, but when the temperature is 90ºF and the humidity is 90%, the backyard morphs into one giant hot box. Unbearable to say the least, especially when you’re wearing a down coat. (Please note we use the word sauna around here, we try not to upset the girls by talking about a hot oven!) The chicks are currently sitting in the shade trying to breathe without moving. I wonder if a cool shower with the sprinkler would do them any good? …I’ve escaped the backyard and am now sitting inside in the air conditioning dreaming about new chickens. I think Roxanne and Cleo will now be receptive to expanding the flock. 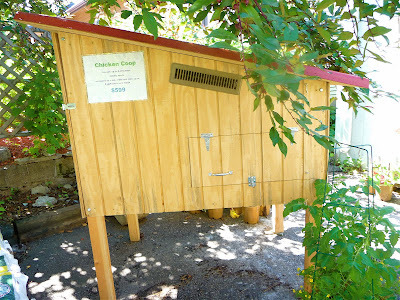 I’ve cleaned the big coop, readied the little Eglu for the new girls and now all I need are the chickens. The problem is, now that I’ve started looking at the variety of different breeds, I want them all. They’re all so unique and so gorgeous. If things work out I’ll head to the feed store this weekend. I will let you know when I bring home some new chicks. Well, I couldn’t wait. Before I ended up posting this blog I drove out to get a couple of new chicks. Will fill in the details soon! Can't wait to see what you'll bring home! Are you going to be on the Parade this year? I was in the Minneapolis/St. Paul area the last week of June. I wish I had known about this store. It would have been a fun stop, as we have nothing like that in Montana. Instead I visited the Mpls farmers market, an Asian grocery on University, Bylerly's and all those other goodies that I used to frequent over 15 years ago when I lived there. Good luck with your new birds. I added 6 new ones to my flock, and turned out pretty well. Only problem was I ended up with a rooster. Thanks for your comment. You visited some great highlights of this area, and next time you're back check out the store. I wish I could add six birds, now I know why people end up with more than a couple of chickens – they're addicting! Hopefully I'll post photos today. Not sure about the parade, I'd love to, just not sure if I'd have anyone come out this far! Get updates by email when there are new blog posts! Three Swingin' Chicks Are Featured on Planet Omlet!